What about Reign of the Dinosaurs at Comic-con? I found the last episode very compelling also. Although I still haven´t seen the 3rd, I´d say that its easily the best of the series. Amazing CGI, engaging narration, and no less great models...kudos to you guys. That Majungasaurus is THE coolest abelisaur I've ever seen. Hands down. Or claws...stumpy hands I mean. It would be REALLY fantastic if we could see ALL of the digital models for Dinosaur Revolution!!! If Discovery would allow that! Here is our Majungasaurus "Momma Majunga" that I sculpted. This was posed printed, and painted by Angie using Ricardo's awesome color scheme. It now sits on the desk of a Discovery Exec as a place to hang their car keys. First of all, the finale of this wondrous series makes it, in my opinion, the greatest dinosaur program yet made. The execution was amazing and it set a new world-wide look of dinosaurs. 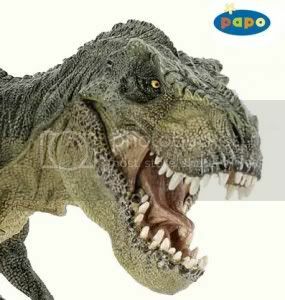 The Tyrannosaurus models were the best I have ever seen. Their bird-like actions were extremely realistic and life-like. I completely agree with the Tyrannosaurus' taking care of their young. 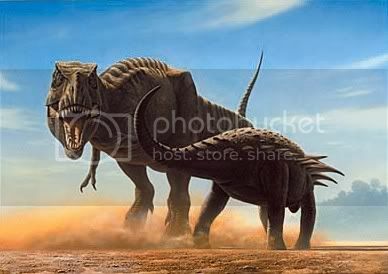 I was also fond of the two Tyrannosaurus teaming up to seize prey. The fight scene when Jack fell on top of the deceased Triceratops horn was completely awesome. I respected how the male Tyrannosaurus 'tickled' the female while mating, which is completely realistic. It was really depressing when the juvenile Tyrannosaurus stumbled upon it's parents corpses and then joined them when he fell off the ledge. The Troodon was very well-done. I like how they artists didn't extend the wing feathers too far. For me, it was just the right length. The nice tone of blue was also very cool. Now I must talk about the herbivores. The Ankylosaurus was accurately portrayed. the best I've ever seen. The bony armor was just perfect. I like the nice shade of brown also. The juvenile Pachycephalosaurus was pretty adorable and the orange coloration was great. The Triceratops was the best Triceratops anywhere. The brightly colored skull, the difference of the scales, and especially the back quills made outstanding. I wish they would have put more of the animal in the show. To sum up this fantastic series, I would like to congratulate David, Angie, Ricardo, Tom, and the rest of the Dinosaur Revolution team for creating the most accurate dinosaur documentary the world has ever seen. Thank you for all your hard work. You are some of the greatest pale-illustrators alive today. I wish you good luck on your next project. Whatever you choose to create, I will cherish it. Once again, thank you so much. It's an evil pony, made of hopes and wonders! Deal with it! The only thing that i didn't liked of the last episode (except for the OBVIOUS butchering by the network... I mean, you can almost see when they cut a scene ) was the young Rex's demise: i'd rather had a more somber outcome, maybe showing the juvenile lookin' at his parents' corpses and then wandering alone for a while before dyin' of starvation or something like that. "never mess with the King"
Where is episode 3 Survival Tactics? I have seen the other 3 but is impossible to find the third one!! Please,if somebody recorded it,upload it to youtube,please!!!!!!!!!!!!!!!!!!! The juvenile Pachy was a Prenocephale, and therefore completely inaccurate as a Pachycephalosaurini of any kind. Good thing Prenocephale-like Pachys could have been present there, but still, not Pachycephalosaurus by a long shot. I just got done watching End Game and I gotta say, I don't know where I stand on it. I liked everything up until the asteroid impact. I would have preferred the extinction event be saved until the very end of the show or the juvenile rex surviving (maybe all the way to adulthood) or the focus be taken off the dinosaurs and onto the animals that we know survived; birds and mammals...show us what they did to survive. I knew the episode was bound to be depressing...it is extinction after all but it just didn't go the direction I hoped it would. Ahhhh, I still haven't seen the second half of this thing, LOL! But its seems like whatever they did with it had some kind of impact (pun? or just bad joke, lol?) I'll end up probably fast forwarding thru anyone on screen talking to see the story when I get a copy of the show. Ah, well. Still cool to see the dinos at least finished. Now I'm waiting for Terra Nova! Not to much longer!!! Best to you guys and I'm glad you liked the dinosaurs. I still can't believe I actually got to make a bunch of dinosaurs for a TV show! I didn't even think of Spoilers, I apologize. I just automatically thought this thread would have them, I even skipped reading posts until I watched it in order to avoid spoilers. oops, soory, i wasn't talking about spoliers I wouldn't worry about posting them as I'm assuming most people would expect them to be here, no worries ;D I'm just behind, lol! But, its good to hear that most people seem to like it, I'm assuming the impact must have been half way thru and then the story switched gears to Troodon? I vaguely remember it. No worries though, post whatever you like ;)I'll catch up at some point, lol. In all honesty I loved "End Game", it just really bummed me out with the asteroid impact. I know I shouldn't judge it based on that but I was hoping it would go in a different direction. Nah, go for it. I hate cheese cake and white wine When the Dinheiros walked out in the 2nd episode I almost hid under a chair, lol. I always thought they were my weakest paint and I was still learning. And then there they are...on screen for the longest of times, lol. Just saw the first two episodes on youtube (HD 720). The animation is superb - liked the Watering Hole best. Animation was incredible, the campy stuff subtle - like 'broken jaw' trying to intimidate the Torvosaurus - if he got that close he probably would not have gotten away. The opening bit with the headless theropod was hilarious - and the Allosaurus animation was amazingly real. The "Evolution Survivors" episode was not as well animated and way too cheeky for my taste. The entire Cryolophosaurus bit was not too convincing. The animals looked way too flattened (narrow) head-on. I can't find the Dinosaur Revolution merchandise at the Discovery Store! If anyone knows where to get some, please reply. Thank you very much. THE CASE OF THE MISSING DVD'S!! The program's creators asked that Discovery NOT sell DVD's until they could create a product more worthy of their creative efforts. Discovery AGREED to "stand down" the product until a later date, when, rest assured, a MUCH cooler product will become avaliable. Please pass the word along to other boards -- and cut Discovery some slack -- as it is somewhat unprecedented for a commercial TV network to voluntarily chop off a revenue stream, just because Creative Types ask them to!! Good news will be announced soon on Dinosaur Revolution, on that, you can be certain. The above statement is true on all accounts. Believe me, it is a big win for all of us.